From the moment we stepped off the zodiac and onto the island, I knew that we had arrived somewhere special. 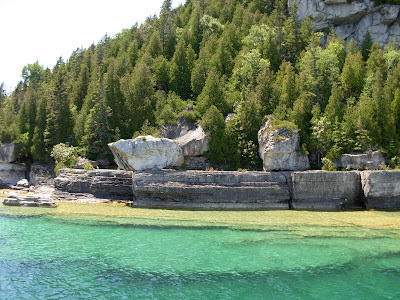 The trip to Flower Pot Island begins in Little Tub Harbour in Tobermory, probably my favorite little town in Ontario. 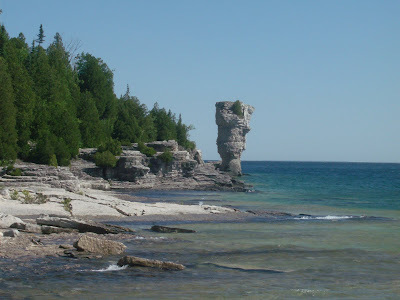 As the zodiac leaves the harbour and enters the waters of Fathom Five National Marine Park, the waves begin to grow. Crossing the wake of the M.S. Chicheeman as it takes its passengers and vehicles across to Manatoulin Island, the zodiac captain ensures that all passengers get good and wet. Approaching Flower Pot Island, your eyes are immediately drawn first to the water which is incredibly tropical looking, and then on to the two sea stacks for which the island is named. 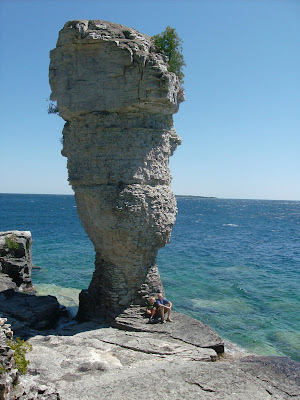 These stacks which are made of dolomitic limestone were created by the surrounding rock slowly being worn away by the crashing waves of Georgian Bay, leaving these magnificent stacks behind. It’s a short hike from the boat dock, through a trails bordered by ancient cypress and cedar trees to the shore where these two flower pots stand, silently standing guard over the island. Standing at the base of them, your imagination takes you back to a time when the water level, much higher than it is today would have been crashing into them, eroding the surrounding rock and eventually receding, leaving only these rock formations standing. This is a great place to swim, take photos or to meditate, taking in the natural beauty around you. You very quickly feel that you have arrived at a unique destination on the planet, truly a very special place. Next week: Hiking the island.